Sitka, Alaska, lies in the resource-rich archipelago of islands that make up the tail of the state alongside the north Pacific coast. The history of Alaska and that of Sitka intertwine in a complex story of cultures and natural resources. To commemorate that history, Sitka National Historical Park was created. Sitka sits on the shore of Baranof Island, an island slightly larger than the state of Delaware. The Tlingit people have lived there for at least 10,000 years, establishing a rich culture based around the abundant natural resources of the region. The ocean is rich in fish and shellfish, the forest grows massive Sitka spruce and other trees, suppling wood for homes, canoes and other materials. The forest is rich in wildlife, providing another source of food and hides for clothing and shelter. Because of the stable and beneficent resources, the Tlingit people established strong families and communities, with traditional music, dance and art. The abundant resources also attracted European settlers beginning in the late 1700s. Russians in search of fur pelts dominated the region for much of the century, establishing the city of Archangel (later Sitka) as their primary trading and administrative hub. The Tlingits fought back against this colonization, notably in two battles, in 1802 and 1804, that the national park commemorates. Although the U.S. bought Alaska from Russia in 1867, the Russia heritage of the region continued—and Sitka now contains two of only four Russian-built structures in the Western hemisphere, one in the national park. The combination of rich Tlingit, Russian and American heritage led early Alaskan leaders to create a local historic park dedicated both to the individual cultures and their fusion. As early as 1890, President Benjamin Harrison enacted the rudiments of a park, making it the oldest federally designated park in Alaska. However, little notice was taken of the action beyond the local community. 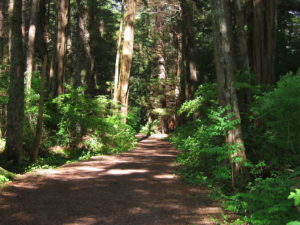 The park suffered from vandalism and neglect until a group of leading Sitka residents convinced President Taft to designate the park as a national monument, on March 23, 1910. In 1972, the park was re-named a national historical park. Today, Sitka National Historical Park occupies 113 acres, but its small size belies its importance. The park honors the Tlingit people and their culture with a series of more than 25 standing totem poles and a heritage center that not only houses an impressive collection of Tlingit artifacts (nearly 250,000), but also teaches succeeding generations of Tlingit children about their cultural traditions. Annual visitation to the park is about 200,000. Antonson, Joan M. and William S. Hanable. 1987. An Administrative History of Sitka National Historical Park. National Park Service. Available at: https://www.nps.gov/parkhistory/online_books/sitk/adhi/index.htm. Accessed March 20, 2018. National Park Service. Sitka National Park, Alaska. Available at: https://www.nps.gov/sitk/index.htm. Accessed March 20, 2018. National Park Service. Sitka National Historical Park, Sitka, Alaska. Available at: https://www.nps.gov/nr/travel/cultural_diversity/Sitka_National_Historical_Park.html. Accessed March 20, 2018.